By now you’ve seen us feature countless treatments and procedures that attest to rebuilding or creating new collagen in the skin. Some of you may be wondering: What is collagen? Why is it so important? And, just why is my dermatologist so concerned about me losing it?! Collagen is a naturally produced protein that supports the structure of our body. Collagen can be found in our muscles, bones, tendons and of course skin. It gives our skin texture, shape and elasticity – making it an extremely important component of the body. There are several factors that contribute to the loss of collagen. The aging process being the main cause, some others include: exposure to the sun and pollution, overall health, heredity, injuries, and lifestyle choices (Ex: smoking). What happens when you lose collagen? Two words. LINES and WRINKLES. The dreaded two things no one is anticipating to see on their face. Collagen is directly linked to the appearance of skin on the surface. Once the skin starts to lose the inner structure formed by collagen, lines and wrinkles begin to visibly form on the surface of the skin. Thermage - This non-invasive procedure contracts and stimulates collagen growth to tighten and firm the skin. Collagen P.I.N. – Creates a controlled injury to the dermal and epidermal section of the skin prompting collagen and elastin growth. Selphyl – Platelet rich plasma (PRP) is extracted from your blood, and injected into the face to stimulate collagen growth. Titan Laser – This device heats the dermis with infrared energy beneath the skin to create smoother, firmer and tighter skin. Genesis Laser – Genesis also uses a type of heat to target the upper dermis under the skin’s surface to promote collagen regrowth. The three fillers listed below help fill in the lines and wrinkles that are a result of the loss of collagen. To see more what Kahn Dermatology offers, visit our services page. To schedule consultations for any of the treatments mentioned in this blog post contact our Cosmetic concierge! The American Society for Aesthetic Plastic surgery recently released statistic numbers for cosmetic surgeries done in 2015. We know what some of you may be thinking, why a dermatologist would be focusing on cosmetic surgeries. To your surprise, many board-certified dermatologists are able to do cosmetic procedures like fat reduction, facial fillers, skin resurfacing, cellulite reduction, etc. – and Kahn Dermatology physicians are among them. Here are some of the cosmetic procedures we offer here, note these procedures are minimally and non-invasive treatments making for a quick recovery and little to no downtime! Tattoo Removal: 39% increase, check out our blog post on how to avoid having any tattoo trauma. 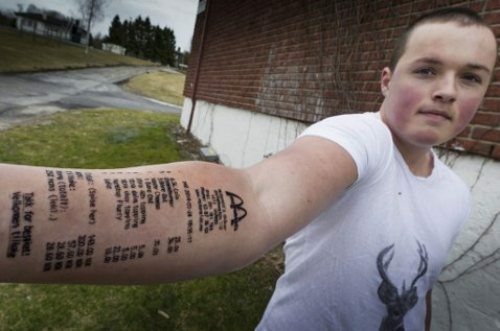 No one has to live with the mistakes or mishaps of the past through their tattoos any longer. Fat Reduction: CoolSculpting - We recently blogged all about CoolSculpting and the newest additions to its line. Sweat Reduction: miraDry – Read more about it here. Laser skin resurfacing: Laser Genesis - Eliminates redness, scarring, uneven skin tone, large pores and fine lines and wrinkles. It enlists heat to penetrate the surface of the skin creating new collagen. We are excited to announce that we have added three new procedures to our list of cosmetic services. Cellfina – Say goodbye to cellulite! Cellfina is on the only FDA-cleared minimally invasive procedure to improve the appearance of cellulite on the buttocks and thighs. The results last for at least two years, the longest FDA clearance for a cellulite treatment. There is a 96% patient satisfaction at the two year mark. Collagen P.I.N: A minimally invasive treatment that targets the dermal and epidermal junction in the skin. The treatment removes skin imperfections and promotes collagen and elastin growth. Specifically it treats: Scars: C-section, burns, acne and surgical scars, stretch marks, dark spots, fine lines, wrinkles and hair loss. Patients typically need 3-6 treatments, severe cases may need 6 or more. There is a quick and successful healing process. Selphyl: Uses platelets extracted from your blood to stimulate the body's natural collagen production. It works to treat: acne scarring, cellulite, hair loss, and skin rejuvenation. Patients usually need up to 3 treatments. There is no risk of an allergic reaction because no foreign substances are used. Results can be seen a few weeks after the first treatment, and can last approximately 12-15 months. Kahn Dermatology always looks to provide our patients with the most in-demand and effective medical and cosmetic treatments. All procedures are conveniently done in our well-equipped offices, making it comfortable and convenient for you. Last July we announced that we were adding CoolSculpting to the list of services offered here at Kahn Dermatology PLLC. We’d like to go a little more into detail as to what this fat reduction treatment does, and tell you about the newest addition to the CoolSculpting line! With spring already here and summer quickly approaching this isn’t a post you want to miss out on. · Proven to be a safe and effective treatment. · CoolSculpting has been featured on many television/news programs and magazines including: Allure, TIME, ELLE, GQ, Women’s Health, E! News, The Today Show, Rachael Ray, Dr. Oz and more. CoolSculpting enlists a freezing technology known as Cryolipolysis to freeze stubborn fat cells that don’t seem to go away with diet or exercise. During the hour long procedure, the fat cells are frozen in a controlled manner, which means it gets rid of fat without harming any of the surrounding tissue. "As the cooling begins during the first few minutes, you may typically feel intense cold. This soon dissipates. With some applicators, you'll feel some pulling as suction is applied. The area generally goes numb within 5 to 10 minutes during treatment. Many people read, watch videos, work on their laptop, or even take a nap during their CoolSculpting treatment. After the treatment, you may feel some tingling as the area is massaged for 2 or 3 minutes." Both men and women have utilized CoolSculpting to get rid of stubborn bulges of fat. The best way to know if you are a candidate for CoolSculpting is to book a consultation with your physician. How many treatments are necessary for me to actually see results? Every person’s body is different, prior to getting your treatment you will have a consultation with your physician to set up an ideal treatment plan. Some patients need one treatment, while others require 2-3, it all depends on the treatment area. Speaking of treatment areas, what can I use CoolSculpting for? CoolSculpting targets stubborn fat in the following areas: abdomen, flanks (love handles), inner thigh, outer thigh, and more recently the double chin! You may be wondering where the fat cells go once they’ve been frozen. In the months following your CoolSculpting procedure the fat cells are naturally processed and eliminated from the body. Patients have reported seeing results as early as 3 weeks, but maximum results can be seen 2-3 months post treatment. Because the treatment is non-invasive, patients are able to return to their normal activities immediately. The treated fat cells are gone for good once expelled from the body. However it is necessary to maintain a healthy weight, excessive weight gain can cause new fat cells to form again. Has anyone I know gotten CoolSculpting? You’d be surprised to know that celebrities like reality-TV star Gretchen Rossi, supermodel Molly Sims who is actually the brand ambassador for CoolSculpting and many others have tried and loved the results! Take advantage of the fact that CoolSculpting requires no surgery, no needles, and no downtime – perfect for the person on the go. For more information about the procedure, booking a consultation, or pricing - contact your cosmetic concierge, Debbie Rossi. With the recent FDA ruling on tanning beds, we thought it might be a good time to review general safety measures when it comes to tanning. Whether on the beach or in a tanning bed, there really is no such thing as a healthy tan once UV rays are involved. Harmful ultraviolet radiation is inevitable when tanning- if you have one, your skin has experienced some degree of skin cell damage. Skin damage and melanoma do not discriminate against age, gender, or race – anyone can get skin cancer, so it is essential to protect yourself when outdoors, even just for a short period of time. We cannot stress the importance of applying sunscreen, creating a barrier between your skin and UV rays is crucial. Stop by either of our locations and ask about the Kahn Dermatology Oil-Free Moisturizing Sunscreen, or any of other products. The number of people indoor tanning as an “alternative” to soaking in the natural UV rays has been alarmingly high for a number of years now. According to the FDA, “Indoor tanning is a known contributor to skin cancer, including melanoma (it’s most deadly form) and other skin damage.” Yet still, a large number of the people opting for the artificial tanning experience are teenagers. It is reported that about 1.6 million minors take part in indoor tanning each year. This startling statistic is probably what prompted the FDA’s recent ruling. On December 18th the FDA released their two part approach to regulating the indoor tanning industry. Restricting the use of sunlamp products to individuals 18 and older. Those still choosing to take part must sign a waiver before their first time tanning and every 6 months after, verifying they are aware of all the risks associated with using sun lamp products. The FDA called upon manufacturing companies to improve the safety of products. For the full news release from the FDA, click here. Self-tanning products – There is a large amount of products out on the market that allow you to bypass the harmful UV rays and go straight to a temporary bronzed glow. There are mist sprays, moisturizers, foams, gels, cosmetic powders – if you can think of it, it’s probably already out there! Check Total Beauty’s post on the top self-tanning products of 2015. The key to using self-tanning products is to use sunscreen in combination with these products because they do not have a significant amount of sun protection built in. Your skin safety is our highest priority, if you have any concerns about your skin please feel free to contact our office. It is clear to see that our skin is the largest organ of the body; this should more than prompt you to take care of it. Remember that dermatologists see patients of all ages, so if you have a concern about anything having to do with your skin don’t be afraid to make an appointment. Kahn Dermatology sees patients for a number of concerns including: medical, surgical, cosmetic, and laser treatments. Finding and preparing for a dermatologist visit can be a bit of work, here are some tips and tricks before making your appointment. Once you know what the problem is it’s time to find the right provider, research is key. Proximity is not always the best factor when choosing a physician. You want to find a doctor that can provide the best care, if they happen to be close to your home or work then that is an added benefit. Consider using search engines like ZocDoc; try searching for reviews, insurance plans, and schedules. It is quite common for people to have more than one skin condition. Use the time during your appointment wisely! Make sure to address your more serious concerns with the dermatologist first. Have excessive dry skin in an area, a mole increasing in size or changing color, existing acne getting worse? These are all things you should mention to a dermatologist at your next appointment. Note when exactly the problem began as well as the changing features. Take photos if you find that easier. This can especially help if your condition has slightly gotten better before your appointment. Eating habits and activities can contribute to skin conditions so be sure to account for that when documenting. Always let your dermatologist, or your primary care doctor for that matter know of any medication, topical creams, supplements, etc. that you are currently taking. If it helps get a list together before your appointment. Most skin care conditions cannot be solved in a day. Some cases are trial and error, while others might require multiple treatments. Be PATIENT and remember the long term goal of having better healthier skin. you really want the doctor to be able to treat your skin thoroughly. Currently Kahn Dermatology is taking appointments for all skin care needs. 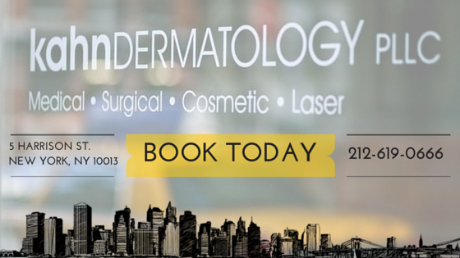 Contact our Tribeca Office today to book your appointment! Acne seems to go hand-in-hand with being a teenager. Of course it’s a part of teendom we wish we could skip especially when it comes to the social scene - having acne poses a serious problem for self-esteem, but for many it is inevitable. Luckily, there are several ways in which teenagers can treat and potentially remove acne for good. So why do teenagers form acne? According to the American Academy of Dermatology (AAD) clogged pores are a major factor in the formation of acne (at any age). There are different types of acne that form on the skin. We say skin because acne is not restricted to the face alone, it can form anywhere on the body really. Acne forms for many different reasons, the list below are not the only explanations for a break out to occur. Acne is as unique as the person who has it. For teens especially the thought of using a laser might seem intimidating, but it is a great non-invasive way to really get beneath the surface of the skin to prevent future breakouts from happening. It is very common for dark spots and scarring to appear once the acne has healed, laser treatments are an ideal way to make the overall appearance of your skin better. Super model and reality-TV star Kendall Jenner recently publicized her struggles with acne, and attributed her new acne-free skin to the Laser Genesis. The painless procedure uses heat to kill the bacteria found in breakouts already existing on the skin, as well as removes scarring from older ones. This particular laser is currently available at our locations. Whichever treatment option you do choose, remember that keeping a consistent regime is the key to managing and potentially getting rid of acne all together. If you are prescribed a topical or oral medication make sure to take it at the designated times on the days you are required to. If you are opting for a laser procedure be sure to follow all post-procedure guidelines. If you or your teen are experiencing trouble with your skin, contact our offices to schedule an appointment or consultation. Many celebrities have managed to stop the hands of time. Actresses and models seem to have found the fountain of youth. Demi Moore, Halle Berry, Sofia Vergara, Cindy Crawford, Naomi Campbell, the list goes on and on! So how exactly are they doing it? And how can we get in on the action? While dieting and exercise are major factors, skin care is extremely important in maintaining your youthful glow. At any stage of life whether you are in your 20s, 30s, 40s, basic skincare is necessary in the anti-aging process. And with all skin care routines whether for anti-aging purposes or not, consistency is KEY; it’s like dieting, you can’t expect to see results after 1 day. Always protect your skin! It doesn’t have to be an 80° summer day in order for you to get a sunburn, it can happen during any season. So it is in your best interest to always be protected. Find moisturizers and creams that have a SPF built in already so you don’t have to worry about applying more than one layer of product. Expensive doesn’t always mean better. Most people do not have hundreds of dollars to spend on beauty products, and that’s okay! There are tons of drugstore products that don’t cost as much and can still do the same job. Vitamin C- This particular vitamin works to protect our skin from harmful outside elements, like the sun and pollution. It also reduces the appearance of brown spots, sun damage, acne spots, and promotes the development of collagen. Retinol- Like Vitamin C, Retinol boosts collagen production which reduces the look of fine lines and wrinkles on the face, it can also even out your overall skin tone. AHA – Alpha Hydroxy Acid- Typically moisturizes and removes dead skin cells from the face. It can also treat acne, diminish the look of scars, firm and smooth, and help the overall look of aged skin. BHA – Beta Hydroxy Acid- Promote the growth of new skin by exfoliating off dead skin, sort of like an AHA. The difference is, BHAs are able to penetrate into the pores to exfoliate dead skin versus just staying on the top layer. Antioxidants – Smooth the skin and fight against wrinkles. What works for one body part may not work for the others. Take your eyes for example, the creams you use on your face may be too harsh for the sensitive skin around your eyes. Using an eye cream can help hydrate the area without irritating it. Always treat your face, neck, chest, and hands the same way! Anti-Aging doesn’t start and stop with the face, other body parts have been known to indicate a person’s age. This means cleansing, toning, exfoliating, and moisturizing all 4 areas. Ladies, make sure to remove ALL make-up, not removing it just might be the worst thing you could do for your skin. In 2013, a reporter for the Daily Mail decided to test this theory out on herself. She went to bed every night, for a month, without removing her makeup – the results were startling to say the least. She experienced a large increase in pore size, redness, dryness, and irritation in and around her eyes. Experts she consulted with stated her skin aged about 10 years in the month she wore her makeup to sleep. Moral of the story: Make sure your face is spotless before sleep. If basic skin care is just not enough, there are always cosmetic procedures. Unfortunately once someone hears the words “cosmetic procedure” they almost immediately revert back to the times when people had to go under the knife for major surgery. Long gone are those days – there are so many minimally invasive and non-invasive procedures and treatments for people to regain their youthful appearance. Dermal Fillers- Add volume to the skin that may have lost its fullness due to the aging process. (Fuller face = younger face). Kahn Dermatology PLLC offers the following fillers. Currently our offices are offering a great promotion for the series of Restylane products as well as Dysport. The offer ends at the end of December, so be sure to contact our offices. o Laser Genesis: Eliminates redness, scarring, uneven skin tone, large pores and fine lines and wrinkles. It enlists heat to penetrate the surface of the skin creating new collagen. o Glycolic Acid Peel: Has been used to decrease the appearance of fine lines and wrinkles. o VI Peel: Reverses the effects of skin damage, as well as stimulates the growth of collagen and elastin which make for firmer skin. The information presented here is so minimal to the large scope of information out there regarding anti-aging. This is why for the first time Kahn Dermatology PLLC, is offering an Anti-Aging Master Class! Become an expert on all things aging from our very own PA Terri Raymond, as well as get fashion advice for dressing the part from a former Project Runway designer. January 10th 2016, New Year New You! One of the youngest of the Kardashian-Jenner clan is currently making her mark in the modeling world. With hundreds of runway shows, AD campaigns, and product endorsements, Kendall Jenner has created an extensive resume at the young age of 20. In a recent article from Life & Style, Jenner admits to suffering from acne, while it is an all too common problem for teenagers, she had the added pressure of being under a heavy spotlight. Looking at Kendall Jenner today you would never consider the fact that had acne at any point in her life, so what does she credit her now-flawless skin to? Infrared energy penetrates the second layer of skin to stimulate the production of collagen which helps with wrinkles, the heat is also used to reduce redness. The laser typically requires 4-6 treatments, but each patient and case is different. Here at Kahn Dermatology not only is Laser Genesis one of our most common laser procedures, but we also have other options for resurfacing the skin. To read more about Kendall Jenner’s story click here. To book an appointment with us today visit ZocDoc, or contact one of our offices. I'm sure you've seen it all! Names gone wrong, misspelling, horrible celebrity portraits, and the one's you just can't seem to explain. They have been around since the beginning of time, but now seems to be a major way people express themselves. Let's just say, there is QUITE a bit of expressing happening in the world today. Everyone wants to look their best for the holidays. Before the hectic season sneaks up on you, take time out for some primping and pampering. Kahn Dermatology offers a wide selection of quick non-invasive procedures that can give you that instant rejuvenated look. Medical Facials – These facials typically follow the same guidelines as a spa facials and work towards the same end result. The difference? Because the procedure is done in a medical office the treatment can be a more specific to the patient, and you are more ensured that the type of products and the amounts being administered are being done accurately. Glycolic Acid Peels – At Kahn Dermatology we use a product, Glytone, which targets aging, fine lines, and wrinkles. VI Peels – These peels can be used on the face and body, and with multiple procedures it can diminish the effects of acne, acne scarring, sun damage, rosacea, and melasma. Chemical Peels - Probably the most known treatment out of the four, chemical peels help the overall look and feel of the skin on the face, neck, and hands. The peel works to reverse the appearance of wrinkles, sun damage, acne, mild scars, freckles, age spots and dark patches. Trying to go a little deeper? This procedure is more time consuming than the other treatments listed, it generally requires about 4 to 6 treatments for maximum results. But it is very much worth it! The procedure has no down-time which is perfect for patients that are always on the go. It targets many of the problems that the peels do, but takes it to a deeper level. From now until the end of the year, our offices are partnering up with GALDERMA to offer our patients 20% off of Dysport and the series of Restylane products. Restylane – Is an injectable that adds fullness and volume to your face, particularly the areas around the mouth. Restylane Lyft- This Restylane product not only adds volumes, but also targets wrinkles. Lifting your cheek area, and smoothing out the lines on your face. Restylane Silk – The newest product, Silk, combats fine lines and wrinkles, and adds volume to the lips. Well, it has finally arrived at Kahn Dermatology! The new procedure is called Kybella. It uses a series of injections to help destroy the fat cells in the area below the chin. Once injected the body releases the fat naturally and allows for new collagen to be formed, making this non-invasive treatment ideal for patients. In a single session of in-office treatment, up to 50 injections are used. The injections are spaced apart in a grid like formation to insure the procedure is administered properly. The physician will determine the number of treatments necessary for the proper results; patients can have up to 6 treatments, but they must be spaced at least 1 month apart. The procedure itself takes about 15-20 minutes, and patients have reported seeing results within a few weeks of their initial treatment. With any cosmetic procedure, some patients may experience swelling, redness, and bruising for about a week. It is common for this to happen post-surgery as the fat cells are beginning to melt away. The results have been proven to be permanent, but excessive weight gain and aging can alter the treated area. 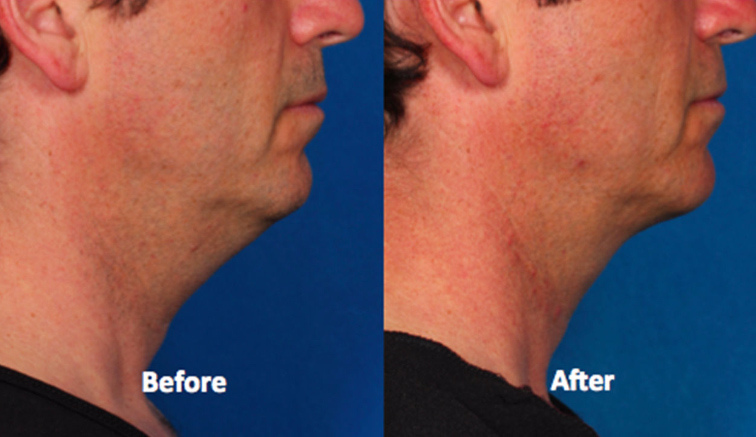 See the Before and After photos listed below to see the drastic difference in appearance of patients that have had the Kybella injections. MiraDry is a treatment for anyone who doesn't want to use antiperspirant anymore. The treatment permanently stops sweating under the arms. That means no more sweat-stained shirts or shirts stained with antiperspirant. The sweat glands under your arms are only 2% of the sweat glands in your body that regulate your body temperature. By stopping sweat under your arms you are not interfering with this process and there are no negative consequences from not sweating under your arms. Underarm odor is mostly caused by a combination of sweat with bacteria on the skin. By eliminating sweating you are also eliminating the main cause of odor under your arms. When you have a MiraDry treatment expect to be in the procedure room for about an hour. You are numbed under your arms before the treatment so most patients report experiencing little to no pain. You may feel some soreness and discomfort under your arms for several days following treatment. At Kahn Dermatology we'll make sure you have a comfortable and positive experience when you have your MiraDry treatment with one of our expert trained providers. Call us for a consultation today for more information on how to get rid of your underarm sweat - for good! Kahn Dermatology Now Offers Coolsculpting! Kahn Dermatology is proud to now offer Coolsculpting treatments! Coolsculpting is a fat reduction and body sculpting device that freezes fat cells. Sometimes even with diet and exercise you still have stubborn bulges of fat - especially around the abdomen, love handles, and thighs. Coolsculpting helps sculpt these bulges to get you the figure you want. Call Kahn Dermatology today to book your consultation. Our New Years Gift Card!! Pick up our New Years gift card with your next visit. Happy Holidays from Kahn Dermatology! *Use from 1/1/15 through 3/15/15 to start your year off right! We have great news! Thanksgiving is not only a holiday for your stomach, it's a holiday for your skin!! Pumpkin - Not only is pumpkin a seasonal favorite, but it is also rich in vitamins A, C, E, & K, fatty acids and zinc. The oil in pumpkin seeds helps to increase circulation and hydration and decrease dark circles, making it a great ingredient for eye creams! Enzymes from pumpkin pulp are great for removing flaky skin and for treating acne. Cranberry - As if we didn't enjoy cranberries enough! Our favorite thanksgiving fruit contains Omega 3,6,9, and vitamin E. It also has natural anti-inflammatory and anti-septic qualities. The oil protects skin from free radicals, keeping your skin looking young! Also, when applied to the skin, cranberries can help treat acne, eczema and psoriasis. Mix cranberry and yogurt to create a homemade facial mask! Butternut Squash - This delicious Thanksgiving side contains a rich source of vitamins and minerals like vitamin A and E, and helps to maintain elasticity and clarity of the skin. Sweet Potato - Now sweet potatoes seem even sweeter! Rich in vitamins A and C, sweet potatoes, help to smooth out wrinkles by stimulating collagen production. It can also help clear acne! November is National Healthy Skin Month and now that the temperature in NYC has dipped below 40 degrees we wanted to remind you to keep your skin and lips well protected! 1. Invest in a good moisturizer and use it well and often! – One that includes Ceramides is great for replenishing skin. The Cereve line of moisturizers is great! 2. Use SPF! - It might not look sunny out, but you have to protect your skin from UVA light 365 days a year. It will also prevent your skin from drying out. 3. Keep those hands covered by gloves when you are bracing the chilly outdoors! 4. Don’t wash your skin with hot water for too long because, though it feels soothing, it will actually dry out your skin faster. 5. Don’t forget about your lips! Aquaphor Healing Ointment protects and helps heal dry chapped skin. 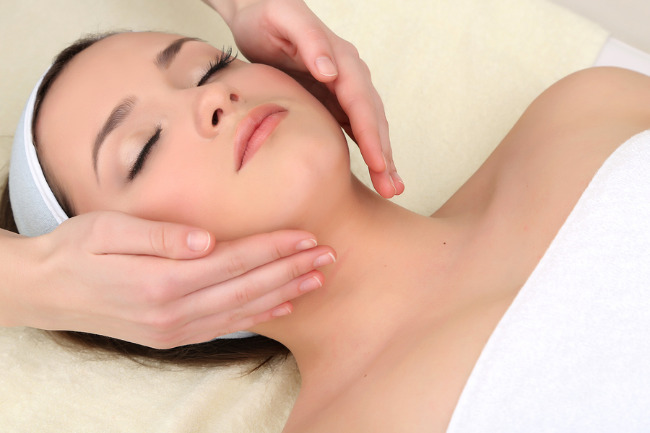 Kahn Dermatology Introduces Medical Facials! Spring is here, and that means it is time to start your Spring Skin Fitness Routine! A non-drying black silt mask that deeply cleans the skin, is one of several steps in the facial, ridding skin of impurities and excess oil. This black mask facial will unclog and refine the appearance of pores, leaving you with a polished and smooth complexion. This purifying facial suits all skin types. So start your Spring Skin Fitness Routine and give yourself the gift of looking and feeling young and beautiful! *Only offered at our Tribeca location.